Ooey Gooey Butter Cake (Paula Deen Style) Recipe — Pip and Ebby - easy, delicious recipes! This is a replica of Paula Deen's totally irresistible Ooey Gooey Butter Cake! Two distinct and delicious layers come together to make an easy and delicious dessert. This is the perfect treat for parties! We are wrapping up our yearly summer trip to Iowa. This year my 20-year high school reunion coincided with our family reunion, so we have been busy spending time with family members and also catching up with classmates that I haven't seen in a decade or two. Dan and I are finishing up our time away by sitting on my aunt and uncle's deck overlooking the lake, listening to the waves crash onto the shore and gazing at the sun as it sets behind the trees. We will be out the door early tomorrow in order to make it back for Elijah's therapies (that we have missed for the past four weeks-yikes!). While I was visiting friends in Texas, we made Paula Deen's Ooey Gooey Butter Cake for dessert one night. I LOVED IT. Seriously, you guys, I could have eaten the entire pan. Once I got back home, I decided I needed to make it again. You know, to share it with other people. Not so I could potentially eat another pan by myself. Of course not that. This is a super deliciously sweet and addicting dessert that will make you fall to your knees. It is Paula Deen's recipe, with just a few teeny tiny ooey gooey additions. Don't stop here with the gooey treat. You have to check out my Salted Caramel Oatmeal Bars and these Gooey Cinnamon Bars! This cake has was made by mistake by a baker in the St. Louis area but it’s a delicious one! Preheat oven to 350 degrees F. Coat a 9x13 pan with cooking spray and set aside. In a medium bowl, combine cake mix, 1 egg and 1 stick of butter. Using a hand-held mixer, beat on medium speed until combined. Press into the bottom of the prepared pan and set aside. Place the cream cheese, 2 eggs and the vanilla in a large bowl. Using a hand-held mixer, beat on medium speed until smooth. Add 1 stick of butter and beat until smooth. Fold in the toffee bits using a spatula. Pour mixture over top of the crust and spread evenly. 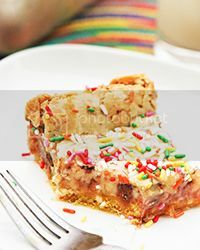 Bake in the preheated oven for 40 to 45 minutes, leaving the center of the cake gooey. Add sprinkles, if desired. Let cool and cut into squares. This recipe is called a cake, but these Ooey Gooey Butter Cake squares bake up more like bars. If you want to serve it like a cake, just use a round pan and it may need to bake a few minutes longer. You can enjoy this for a day or two sitting out in a sealed container. But will they last that long? Probably not. If you want to prepare this and freeze it, tightly wrap the bars in saran wrap or aluminum foil, then place that inside a tupperware or freezer ziploc bag. It should remain in good condition to thaw and enjoy later for a few months. Enjoy it while it lasts 'cuz it will not last long, people. Thank you, Paula Deen! This is Paula Deen's Ooey Gooey Butter cake! Soooo goooooood! Place the cream cheese, 2 eggs and the vanilla in a large bowl. Using a hand-held mixer, beat on medium speed until smooth. Add the confectioners’ sugar and beat until smooth. Add 1 stick of butter and beat until smooth. Fold in the toffee bits using a spatula.